#FrankieWIP Christmas Cold and Editing! This is the final part on how I make my trailers, and it is by no means the least important; adding music.When making a video, choosing the right music is vital. Music sets the tone of the entire project. There are times when choosing the music for a video has taken me far longer than any of the art or rendering for the entire project. It is always best to either use your own music, or–if you are like me and unable to create your own music–find free music and sounds. This sounds simple enough, but truly royalty-free music isn’t music you rip from the internet. What you have to find is music listed under a creative commons license. The way in which you can use this depends on which license it is under. There are six main types of creative commons license. The best way to explain them is to watch this short video which tells you what you need to know. There are a few sites I use for music, sound effects and such for my videos, all with content listed under various creative commons licenses. The site I use the most is incompetech.com by Kevin MacLeod. Music on this site is predominately licensed under a creative commons attribution, which means I can use it so long as I credit Kevin as the creator and provide a link or information back to the site. He also has a handy page explaining the different licenses his work holds. 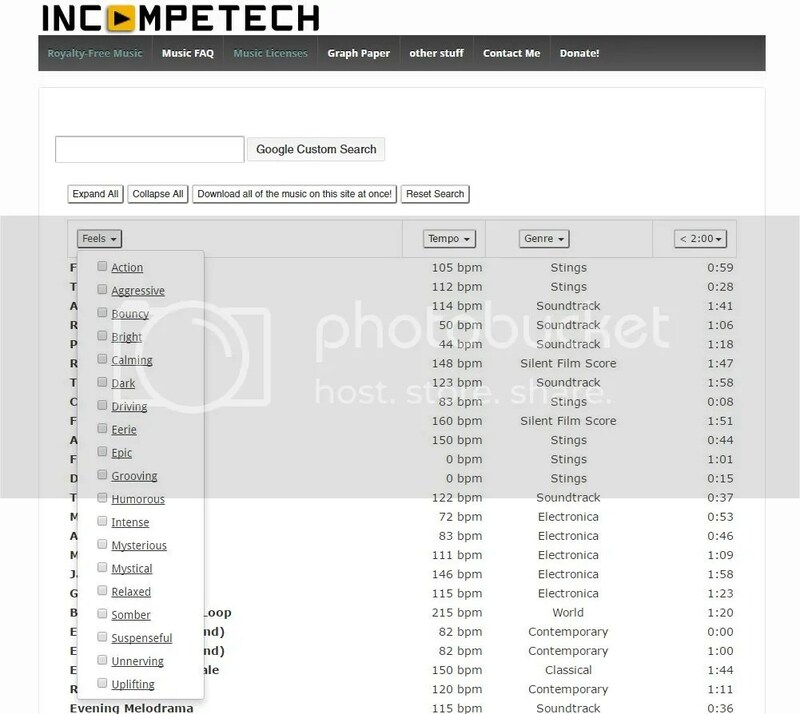 Another useful tool provided on Incompetech is the ability to search for music according to feels, length, genre and tempo. This comes in particularly handy when you know the length of the video and the tone you wish to set. The drop down menus make it easy to find the piece you want out of hundreds of songs. By the time I search for music, I already have the video I’m making finished. If we take the short video I made last time as an example, I know it is only twenty-five seconds long. A search for songs of this length on the Incompetech still gives me a sizable list. By going through the feels filter, I find a song that is the right length and what I think sounds right for the video. When you press the name of your chosen song, you can see that Incompetech has a handy link which includes the attribution which Kevin has provided. So it is easy to use the licence and attribute the music back on my projects by simply copy and pasting the information in the link. Once I have downloaded the song and the attribution information, I can then use the song in my video. I can either add the attribution for the song in the end credits of the video as I did in my Malevolence trailer, or in the video information on Youtube, as I do for my vlog videos. Once I have the song, I add it to the video using Movie Maker.